Of course I consider myself a fabric addict but there is more to sewing than just fabric and we can't forget the handy notions that make it all possible and help us create beautiful things. The Fat Quarter Shop are kindly sponsoring a giveaway of my chosen notions. I picked the ones I use a lot, wouldn't want to be without and would like to share with you because I know you will love them too! - A pack of 50 Clover Regular Wonder Clips You don't know how brilliant these are until you start using them. Excellent for holding down binding, useful for bag making or any instance where you need to clip things together. I regularly use them just to keep my EPP or hand sewing pieces in order. - Aurifil 50 wt thread #2021 The most fabulous thread in beautiful Natural White. I use this colour a lot and it is perfect for piecing. - Clover White Seam Ripper I would like to rid the world of rubbish seam rippers, using a really good one makes a horrible task so much easier. The larger handle and sharp ripper make all the difference! - Sewline Styla Water Erasable Pen I use various methods of marking for different projects but one of the most reliable and useful is a water erasable pen. I use it for quilting, embroidery and hand piecing. - Clover Patchwork Pins I have used lots of different pins but glass head pins are my very favourite, there is something so charming about them and these extra fine ones are perfect for patchwork. When I shop online I like to be able to add haberdashery items to my basket and the Fat Quarter Shop stocks a fabulous range of notions along with their vast selection of beautiful fabric, so don't forget to check out their Notions and Thread section when you are shopping! 1. Leave a comment below, if you are stuck for something to say let me know which notion you would find most useful or what you are currently sewing. 2. Followers of my blog get another entry, just leave a separate comment telling me how you follow and if you are new here and so inclined feel free to hit the follow / subscribe / reader buttons ↗ (optional entry). 3. Share on social media and leave another comment telling me how you shared (optional entry). The giveaway is open internationally, it will end on Saturday 15th November and the winner will be chosen by random.org. I agree with you on all counts, my clover clips are scattered all over the house and get used in lots of ways. I keep a clover stitch ripper in every project bag along with glass headed pins. I have not used the fat quarter shop yet but have made some of Kimberley's quilts. I so agree with what you said about seam rippers. This is my favourite one too. I happily follow you through Bloglovin. what a great selection! I desperately need a new seam ripper and Aurifil 2021 is always welcome! Thanks Lucy and FQS! I follow on Bloglovin and by email! My seam ripper is dull so this would. E helpful. Plus I could use more clips. Love them! I have seen various people using those clips and I have been intrigued at how useful they would be (seem a great idea). Thanks for a great giveaway. I would love to try the Wonder Clips and some Aurifil would make me a very happy girl too. Hah! I just hag this discussion with my quilting friend, we agreed that the seam ripper was our favorite tool!! Thanks for the chance to win your favorite notions!! I follow you via Bloglovin'!! 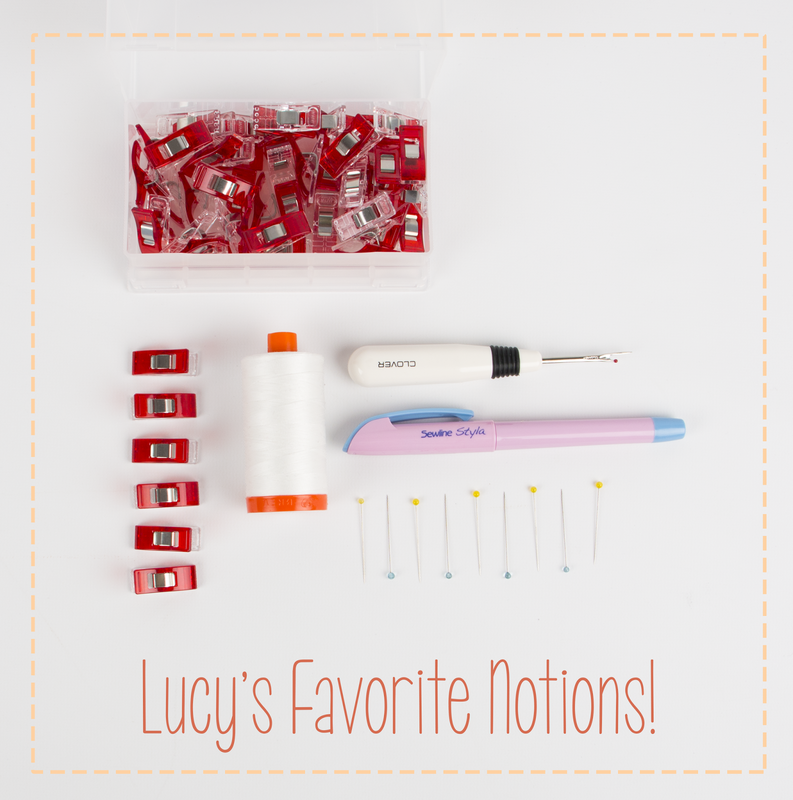 I love 'notions' and I use Aurifil 2021 too. I'd love the marking pen and wonder clips! I follow you with bloglovin! Thanks!! I'm working on the binding for a round robin quilt my 3 sisters & I made, so the Wonder Clips would really come in handy right now. Thanks. Fabulous givraway Lucy. Wupuld love to yry the wonder clips. Seems like I can't live without my seam ripper nowadays!! I am definitely a follower of your blog! I'd love to try the wonder clips! I've heard so much about them! I love those clover clips too. Much nicer than pricking your finger on pokey things. I have a huge list right now that it overwhelming me. I just need to sit down and make a written list and just choose something. I need to try the Sewline pen....and use my seam ripper way too much! I only have 10 wonder clips. I definitely want more. I couldn't believe the difference a good seam ripper could make when I borrowed one at a sewing day. I would Never go back! I think I follow you on blogluvin', but in any case you are on my inspiration list of blogs on my side bar. Keep it up! I can't wait to see more of your green tea quilt. Those are all great tools. I agree that the Aurifil threads are wonderful - worth the extra cost. Thanks for the chance to win. The wonder clips for sure. I've been wanting then for ages. New pins might be even more useful though. My old ones are at the end of their life. oooooo love this! I'm often shocked by how much a good notion can change the sewing process - I spend a lot of money on fabric but often think of notions as "a waste"... but when I actually buy them, it's SO worth it! Thank you so much for your giveaway, Lucy. I would love to try the wonder clips since I have heard so much about them And all the other notions would be wonderful to own. Thanks for the chance. I'm new to quilting so I am still building my notions inventory. The clover clips are something I want/need. Thank you for this giveaway. I follow you on Bloglovin. Thanks for your inspiring blog! I have made a couple weekender-type bags, and I sure could have used the clover clips and seam ripper. Thanks for the chance to win! I need my thimble wherever I am sewing by hand. I love that seam ripper - thanks for the chance to win. I love the clips! Use them but they are pricey. Would love to win a box of them. Thanks. Following on bloglovin & instagram. I love the clips, I no longer poke myself when binding. I would love to test the seam ripper, mine is ok, but would like a really good one. You have excellent choice in notions. I can't believe I ever managed to make bags and the like before I discovered wonderclips. I have a love/hate relationship with my seam ripper. Thanks! I keep meaning to try the clips. I have 3 seam rippers, and the Clover one is by far my favorite. I love the Clover clips too. I am always finding a new use for them. Great collection of notions. I can only currently locate my tiniest seam ripper. I have no earthly idea where the other two have gone to..I blame the cat. Great notions choices. I love my wonder clips and fanatically count them when I put them away to make sure one hasn't gone missing. I don't think I could sew without my seam ripper and the clips are so very useful for all kinds of things. Of course I'm a follower via old school blogger. I haven't tried the Clover clips yet but I know that I would use and love them if I had some. Your favorite things would make a prefect addition to any quilter's tools stash. HELLO, THANK YOU+FQS for a neat giveaway! I love+use these notions too; especially the pins ! I just cannot live without my frixion pens. I wonder how did I survive without them for so long? Following you on bloglovin and loving it! I've never tried the clips....they look an improvement on my old clothespins! Oh I love notions, and the only thing I have out of that pile of goodies is the seam reaper. Thank you. You and I share several "favorites" in the notion world! I am currently working on a Christmas tree skirt for my son. this is not the first one I've made for him...his ex-girlfriend liked the first one so much that she took it with her when she left. Bah. I think the clips would bring order to my chaotic binding ... which would be good. I am following you through email Google. I am following you on face book. I like having a great tool on hand! Every job is easier with the right tools. I also love to have a long bent nose tweezer, so useful for holding the fiddly ends as they go under the machine, for threading the overlocker, for fitting where fingers are in danger.... wouldn't be without it! and I follow you on the side bar in my blog.. I really, really want some of those wonderclips and my current seam ripper is dull, dull, dull! Thanks for a great giveaway! Great giveaway!!! I love notions like I love office supplies!! You can never have too many! I have heard such amazing things about the wonder clips I would love to see how they help me with my iminent Sew Together bag! I follow you on Bloglovin'! What a great giveaway, thanks to you and FQS!! I'd have to try the wonder clips, everyone who has them does rave about them.... And I haven't seen them available anywhere down here. I could definitely use a water erasable pen but really must try those natty little clips, they look so useful! I would love to try those clips - I follow you on Bloglovin. Thank you! I follow you on Bloglovin and look forward to your blog. It would be really funny if I won the Wonder Clips because that is the only thing I ever won and it was from Fat Quarter Shop! You can never have too many seam rippers. Why do they put lids on seam rippers? They always end up lost. To all of you commenters that don't have Wonder Clips yet, don't wait, get some on your next shopping spree. Actually I could use more Wonder Clips or a new seam ripper. Thank you for this give away, and thank you too Fat Quarter Shop. I am ljbisme at msn dot com. Wow! What a spectacular giveaway Lucy! I'm making flower blocks from my stash/scraps at the moment! It is turning out to be a fun quilt! I am a long time follower via my blogger dashboard! they all look like wonderful aids to beautiful sewing! I am sewing a set of table runners for holidays/seasons throughout the year. The set of 6 or 8 runners will be a gift for a wedding shower. I think the cover clips are the best thing since sliced bread.. I love your blog and kissed to be your friend on FB.. I love the clips and need more!!! sewing clips are always handy! thanks for the give-away! Love the wonder clips. Could always use more! I'd use the water use them all! But, the water erasable pen & the Aurifil thread would get used up quick! I also follow your blog via facebook. I would love to try the clover clips! I shared & liked on FB. Aurifil thread is the best and I never have enough clips! !! Thankyou for a lovely giveaway 😊 I would love to try the clips, anything to help with binding! Aurifil thread is beautiful, I'd love to begin a collection. I am currently working on some quilts for Christmas. :) Thanks. I really need a new seam ripper and those clips!! Love wonder clips and I need a seam ripper. Thanks for the giveaway! I am so in love with the thread. Just purchased my first spool. Sewing withit is heaven.Currently I am working on Christmas stockings, 8 of them!. Using all kinds of crazy colors and cool fabrics. One can never have too many Wonder Clips ... the best invention ever! Thank you for the chance to win. I would love to try those clips! Can't see without wonder clips. Love the clips and only use aurifil in my machines! I would love the wonder clips. I think they will do wonders for me!!! Irecently purchased the Wonder Clips and they make any job so much easier. I would love to win more of these! I love and use all of the notions you show. These are all at the top of my list. Thanks for a great giveaway. I love your blog - one of my most favourites - I follow through email and bloglovin. I follow you thru email....blog lovin. The clips would be amazing, presently I pin binding and my piles of blocks.....so hard. I love Clover pins...they glide thru fabric. I use Aurofil thread only, adore hand sewing with it and never knots in my machine. I will share you on Facebook and pinterest. Love my many rulers. No doubt. Thanks for the chance. I couldn't live without mt rotary cuter and rulers. You have great taste in notions! Good tools do make a difference. I like these, too. Lovely giveaway. Sadly my last clover seam ripper died a death - Turns out that if you keep it in tupperware box, you need to make sure the end of the seam ripper is clear of the edge before you clip it shut with force. Whoops. love my wonder clips and seam ripper. The clover clips are terrific. You can't have too many seam rippers. I am always misplacing mine. I would justloveto give the Clover clips a try. Following now, trying to share, current project is Christmas gifts and a skirt for me. thread, clips, pins, pens ... oh my! And I do my fair share of "unsewing" - I'm currently making #1 of 3 coordinated quilts for a mountain home, using Riley Blake "trail mix" fabric line. I love the clips, I am currently making a mug rug and those clips help with the binding. Really like all of your notion choices and of all of them my favourite would be Aurifil thread. I use it for all my sewing and quilting needs. It's a dream! Wonder clips are pretty cool too. I just started following you via email! I need to try these clips. I'm probably the last person not using them. I have 6 of the clips and love them. More would be so much better. I will share on FB.